I know we are all limited by the size of our hoops and there is nothing worse than discovering that a design you have fallen in love with is just a little too big for your hoop. My collections are created in such a way that hopefully there are plenty of options but the need to resize happens and I wanted to address it. Take my Romantic Crazy quilts. The large quilts are usually created for 8″ x 8″ hoops and you may ask why I opt for that size. Firstly I adore this hoop and until they bring out another square hoop which is larger, it remains my all time favourite, because the tension on the fabric is equal on all sizes and it holds the fabric so well. 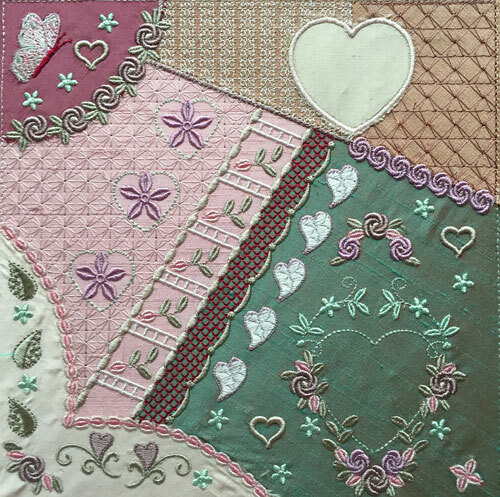 The other reason I use this hoop for the majority of my crazy quilt blocks is that I am able to incorporate many more elements and stitches into the blocks. So what will happen if you take an 8″ x 8″ design and resize it for a 6″ x 6″ hoop? The answer is not that straight forward as it really depends on the design and the types of embroidery stitches that the digitiser has created within it. My crazy quilt blocks include rows of embroidery stitches that mimic hand embroidery, and these could be seriously comprised. Open work embroidery is also more likely to lose its flow too. As well as the type of design, how you will resize it will come into the equation. There are at least three ways to resize a design. Firstly it can be done on your embroidery machine, it can be done in your embroidery software and it can also be resized in its original digitising format by the embroidery software that was used to create it in the first place. The results of the first two methods will depend on how powerful the machine or software is. The last option is the best, as the digitising files contain settings for separate elements and so resize much better than the embroidery file that you purchase from me. You also must consider that the larger the adjustment you make, the more obvious the depreciation in the quality of the stitch out will be. My advice is to make a small adjustment and then zoom in to see how it has effected the stitches. What may appear to be OK will look very different up close and in stitching out, gaps and misaligned stitches may be more evident. I have not touched on the legal side of this either. My terms and conditions may vary from those of other digitisers so you need to check them carefully. I like to give as much freedom to be creative as possible, and there are no limits in the use of my designs in their original form, but when the finished embroidered project is going to be sold, permission must be obtained for any editing excluding resizing and colour changing. While we are on this subject may I remind you that when you purchase designs, you are actually purchasing a licence to use them and that the original design remains the property of the digitiser. The licence is exclusive to the purchaser and this is the reason why most embroidery designs should never be shared with others. 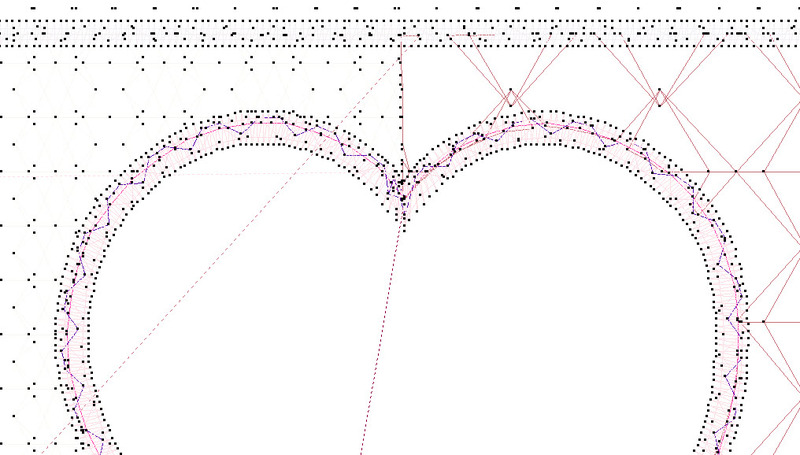 Let me show you a few samples of resizing. 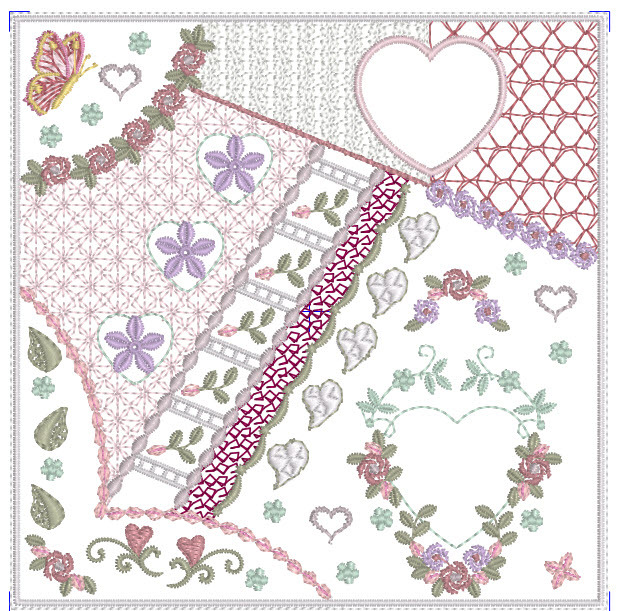 This is Romantic Crazy Quilt 4 (GFE-RCQ-4-8×8) which I will resize for a 6″ x 6″ hoop. This version of the design was reduced to 75% for the 6″ x 6″ hoop, by the Modify module in Husqvarna’s Premier +2 which resulted in a stitch count of 29606. Notice that the motif fill to the right of the heart no longer has regular shaped diamonds and that the bullion roses are damaged considerably. Basically too many stitches have been removed. 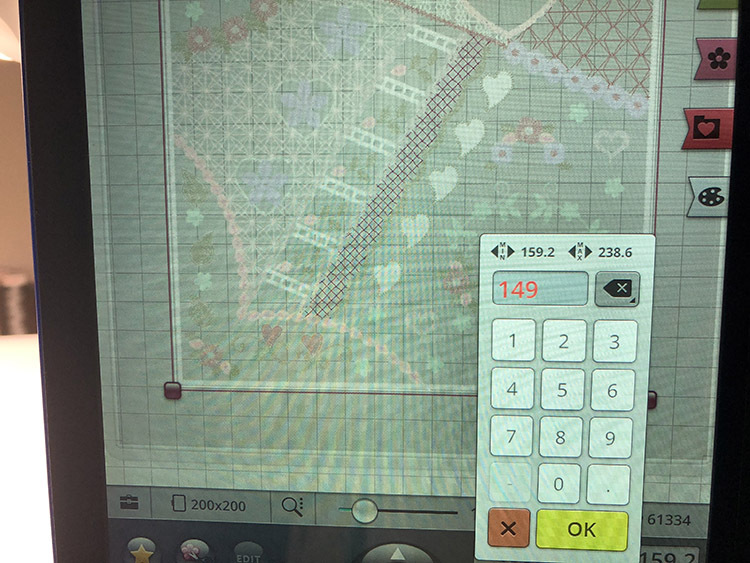 So I did the conversion in the Premier Embroidery Ultra and I thought I had got better results until I noticed that the stitch count had not changed so I checked the stitch density. Oh dear! Here is the results after I reduced the density to just dense and the stitch count reduced to 57950. Not too bad. I reduced the design by just 10% in Modify and got better results but I noticed again that the stitch count did not change. This version was done in my commercial Wilcom Embroidery software as I converted the original digitising file to just under 6″ x 6″. The stitch count was 40346. Please excuse that I have not corrected all the colour threads. You can see the difference in these methods and how too many stitches can disappear or not enough are removed when designs are resized. Lets take a look at a different design from my hugely popular Marianne collection that features candle wicking so it has very distinct and unique stitches, which I have found will suffer with resizing. 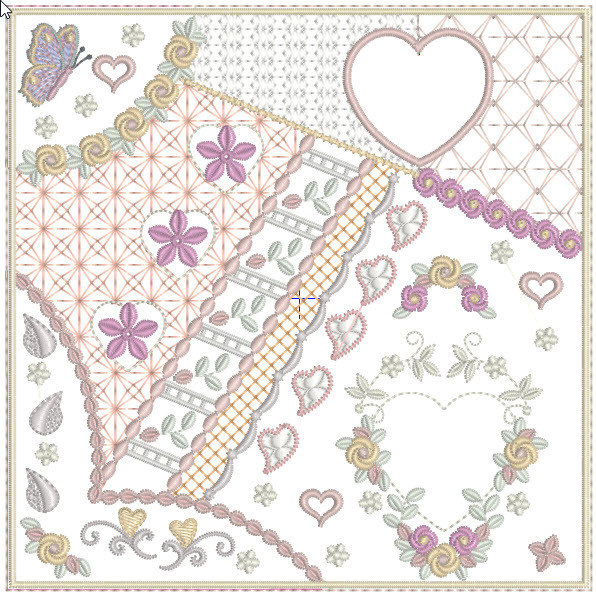 This is part of the first Marianne Quilt block 1 in its original form. When I reduce it in Premier Plus 2 embroidery Ultra to around 5.5″ square this is how it looks. A fair result, but here is the terrible result from Premier Plus 2 modify, which just goes to show that you need to know your software and which modules within it will get the best results. Well I hope I have not lost you all! 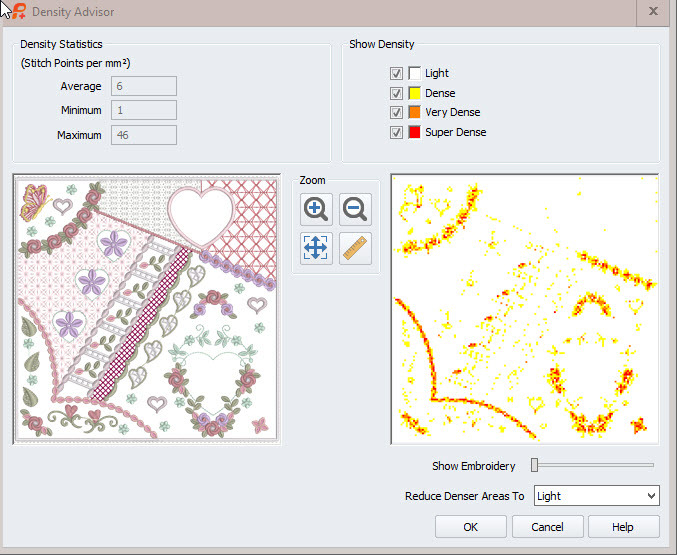 Get to know how to resize in your embroidery software, and how the settings can give you the very best results. Zoom in and check the results carefully in every area of the design. 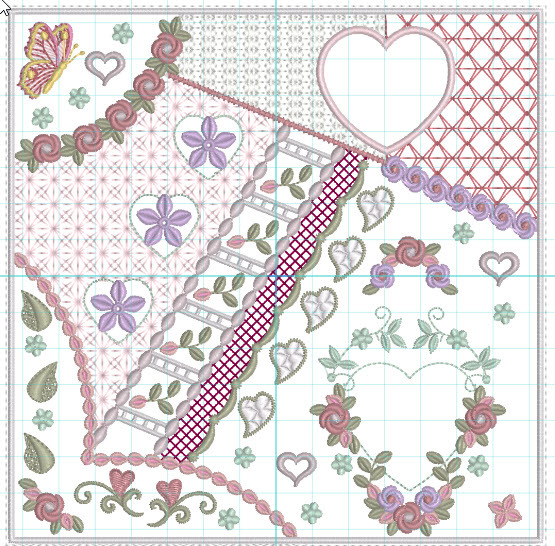 If the stitch count has not changed then parts of the embroidery may well be too dense. Do not try and make large changes. Up to ten percent is probably workable, but it really depends on the actual design as I have explained. I have zoomed in on these two version of this design. Compare the two images. Look at the alignment of the satin stitches around the heart. Can you see which is the original? Yes the lower one is the original embroidery design. If the embroidery is for something important or you are going to sell the finished project, it maybe that your resizing results are not perfect enough, so contact me to get advice on whether a design can be resized successfully. I am able to do quite quickly in my commercial software and it is always interesting to see what you are doing with my designs. This article was the result of such an enquiry. Now I did try and alter the crazy quilt block on my Epic machine but it would not allow such a larger adjustment which shows it knows its limitations. So in closing I would be say be careful, but have a try. That’s the way we all learn and as always when you are changing designs make a duplicate file at the start with a different name so the original file is not lost. 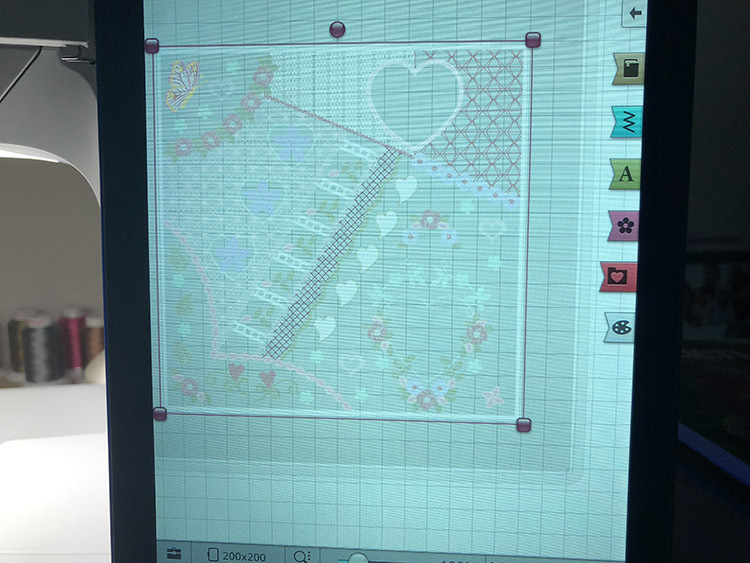 This entry was posted in Discussing machine embroidery and tagged Crazy quilting, machine embroidery, resizing embroidery, stitch density. Bookmark the permalink. 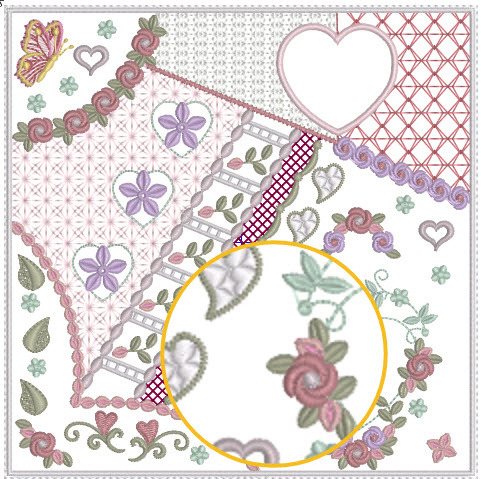 4 Responses to How to resize embroidery designs? Thank you for commenting. I am delighted that it was helpful. This is a great tutorial on resizing designs. It also shows the importance of test stitch outs, especially if you are working on a special project or with special fabrics. Thank you.